This product is featured in: Fairline Targa 38 heading to London On-Water Boat Show. The layout of the 50’s cockpit was a point of contention – some liked it, some found it an odd waste of space with the centrally located seating giving you great access down either side to the bathing platform but guests had to perch without backrests during alfresco meals. 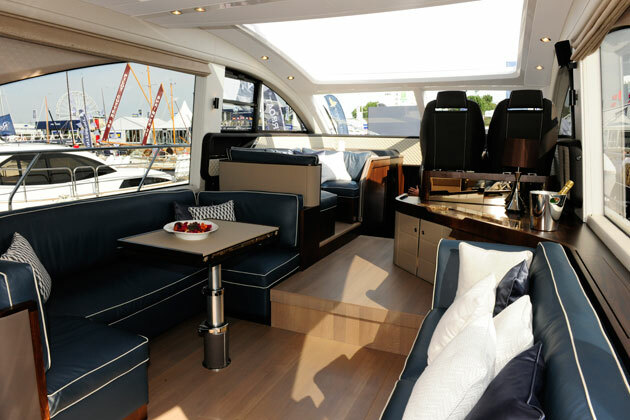 The 53’s layout is more uniform with a walkway to port leading to the wet-bar and a generous wrap of seating to starboard where everyone gets a backrest. Aft is a sunpad, which looks like it sits atop a tender garage but is in fact space for a single berth crew cabin (mainly aimed at the Far East market) or storage space if you’re an owner/operator. The tender is dealt with on a hi-lo bathing platform now that the slightly gimmicky Tender Launch System has dropped off the options list. Fairline has adjusted the engine options on the 53 so you still get the base D11 675hp from Volvo but the Caterpillar option has been ousted in favour of the D11 725hp and there is also a 710hp Cummins on the way that isn’t yet on the UK price list as the necessary testing hasn’t taken place. Our boat had the largest 725s in the engineroom, giving what the yard cautiously rates as 32 knots on the website. On trial, with test kit on board, seven crew, safety stores and full fluids, we topped out at 34 knots on a two-way run – pretty good going. There wasn’t enough time to get comprehensive fuel figures but at 1,900rpm at 27 knots the boat was burning 170lph and delivering a range of just over 300 miles with a conservative 20% reserve. And, if our brief run out is anything to go by, those 300 miles will be suitably relaxing thanks to well contained sound levels, especially with the cockpit doors shut. It was a calm morning but Southampton’s shipping traffic created sporadic chop for us to give the hull a bit of a test, yet none of this managed to unsettle the boat in the slightest.